Mode and Segment have made understanding your customers’ cross-domain behavior a problem of the past. For e-commerce retailers, that means you can track how visitors move across your domains to find out which products have the most pull for these audience segments. See the dashboard and the queries that power it. Mode Definitions are saved SELECT statements that you can reference in queries throughout the platform. 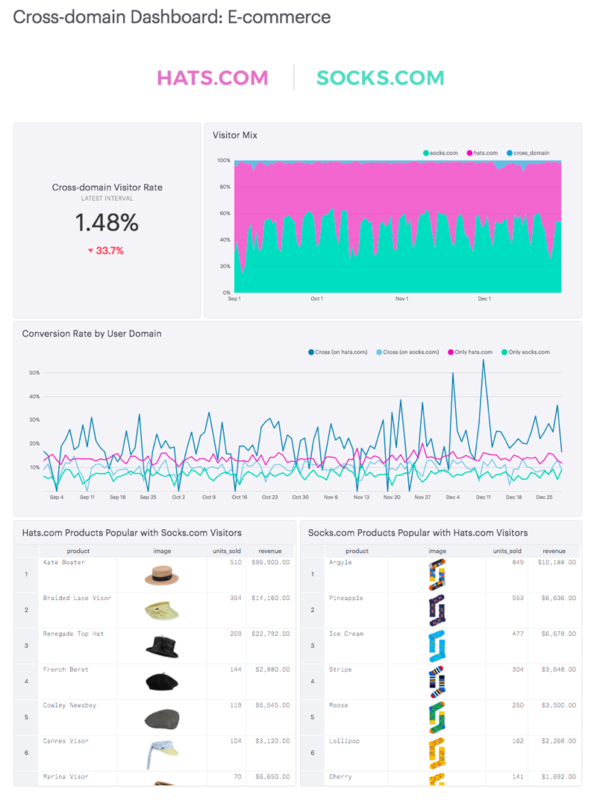 The E-Commerce Cross-domain Dashboard uses three Definitions: @user_domain, @hats_order_products, and @socks_order_products. Create Definitions on your data source using the above code. Note that you’ll need to update the demo. schema to match how it appears in your data source. Once you have the Definition set up, clone the dashboard by clicking “Clone” at the top. Once in the Editor, be sure to switch from the “Mode Public Warehouse” to your connected database. Then click run. When you click into the Report Builder, update the Definition names in each query and the dashboard will populate with your cross-domain data. Be sure to set a schedule so this dashboard refreshes each morning and choose how you would like to distribute it to the team (via Slack, email, embed, or presented on a TV). You can brand your dashboard using Mode themes. This report uses Mode Grey theme, but feel free to update it to your preferred look. Customers on the Plus Plan can also create custom themes to keep the dashboard on brand. This dashboard is just the beginning of the analysis you can do on cross-domain visits. You could dig in more deeply to user attributes to find out how audiences differ by brand or create a unified understanding of lifetime value by looking at customers’ purchases across all of your properties.